An excess of the proinflammatory substance IL-18 is present in joints of patients with rheumatoid arthritis (RA), and expression of IL-18 receptor (IL-18R) regulates IL-18 bioactivity in various cell types. We examined the expression of IL-18R α-chain and β-chain and the biologic effects of IL-18 in fibroblast-like synoviocytes (FLS) after long-term culture. The presence of both IL-18R chains was a prerequisite for IL-18 signal transduction in FLS. However, all FLS cultures studied were either resistant or barely responsive to IL-18 stimulation as regards cell proliferation, expression of adhesion molecules ICAM-1 and vascular cell adhesion molecule (VCAM)-1, and the release of interstitial collagenase and stromelysin, IL-6 and IL-8, prostaglandin E2, or nitric oxide. We conclude that the presence of macrophages or IL-18R+ T cells that can respond directly to IL-18 is essential for the proinflammatory effects of IL-18 in synovitis in RA. A proinflammatory role for IL-18 in rheumatoid arthritis (RA) pathogenesis has been shown by the activation of T cells and macrophages in primary cultures of RA synovial cells . An excess of biologic, active IL-18, exceeding the anti-IL-18 inhibitory activity present in RA synovial fluids, further supports its relevance , and higher concentrations of IL-18 in RA synovial fluids than in osteoarthritis (OA) synovial fluids reflect upregulation of this molecule in RA . Induction of IFN-γ in T cells by IL-18 requires the presence of costimulatory molecules, e.g. IL-12 or IL-15 [1,3,4]. In contrast, degradation of inhibitor of kappaB (IκB-α), subsequent activation of NF-κB, and enhanced expression of intercellular adhesion molecules (ICAM-1), inducible nitric oxide synthase (iNOS), inducible cyclooxygenase (COX-2), IL-6, and stromelysin (matrix metalloproteinase [MMP]-3) by IL-18 in nonlymphocytic human cells appeared independent of costimulatory molecules or IFN-γ [5,6,7]. Expression of all these molecules represents important features of bone or cartilage invading and destroying activated fibroblast-like synoviocytes (FLS) [8,9]. In this paper, we address their putative direct regulation by IL-18 and expression of the IL-18 receptor (IL-18R) in FLS. For additional indications of a suggested T-cell-independent, direct proinflammatory role for IL-18 in arthritis, see Supplementary material. Expression of a functional IL-18R is known in various cell types, mainly leukocytes (see Supplementary material) and is represented by the IL-18R α-chain (IL-18Rα) – synonym IL-1-receptor-related protein 1 (IL-1Rrp1) [10,11] – and the IL-18R β-chain (IL-18Rβ) or accessory protein-like (AcPL or IL-1RAcPL) [12,13,14]. Expression of IL-18R is detectable in synovial membranes in RA , but present knowledge about its expression in isolated FLS is preliminary. We investigated a broad panel of synovial-membrane-derived FLS (FLSSM) cultures from 11 patients with RA who fulfilled the criteria of the American College of Rheumatology  and were undergoing synovectomy and from 3 patients with OA who underwent joint replacement, and of synovial-fluid-derived FLS (FLSSF) cultures from 9 patients with RA and 4 patients with spondyloarthropathy (SpA) . Tissues were minced and digested with collagenase for 2–4 hours; FLSSF were obtained by culture of the total synovial fluid. Supernatants and nonadherent cells were removed after 24 hours, and adherent cells were further cultured to confluence in a 37°C humidified, 5% atmosphere CO2 in Ham's F10 medium supplemented with 10% fetal calf serum, 100 U/ml penicillin, 100 μg/ml streptomycin and 2 mM glutamine. 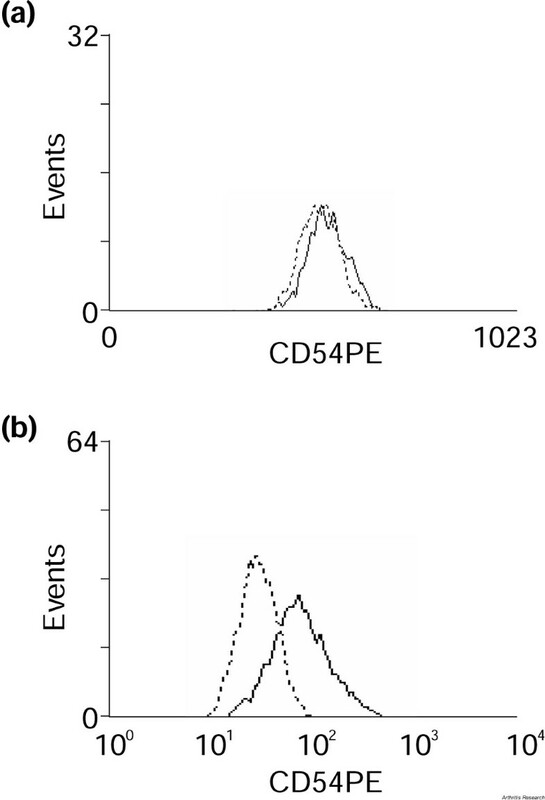 All FLS cultures were shown to be negative for CD14 and CD86 and positive for fibroblast marker Thy-1 before being used in experiments between passages 2 and 6. Stimulation experiments were performed in 1 × 105 FLS/ml for 48 hours unless otherwise stated. All biopsies and synovial fluids were obtained after the patients had given their informed consent. For comparison, additional experiments were performed in the U937 monocytic cell line. Expression of IL-18R was demonstrated using reverse transcriptase polymerase chain reaction (RT-PCR) for IL-18Rα and by anchored IL-18Rβ RT-PCR. The intensity of expression was estimated by the individual IL-18Rα/β/β-actin optical density quotient (ODQ) and by IL-18Rα western blotting experiments. In addition, FLS surface-bound IL-18 was shown by chemical cross-linking of a biotinylated IL-18 glutathione S-transferase (GST) fusion protein. For details see Supplementary material. FLS (5 × 105) from two patients with RA were each cultured in duplicate, either in media without additional stimuli or exposed to IL-1β, IL-2, IL-12, IL-15, IL-18, IFN-γ, tumor necrosis factor (TNF)-α, or IL-12 + IL-18. Cells were removed after 24 hours for analysis by IL-18Rα (35 cycles) and β-actin RT-PCR. RT-PCR kinetics and IL-18Rα western blotting experiments were performed if even one of the four experiments gave a positive result (increase of ODQ ≥ 100% by cytokine stimulation). FLS (1 × 104 cells) were cultured in 200 μl medium for 3, 5, or 7 days. Cell proliferation was determined by colorimetry with the tetrazolium/formazan assay . Light absorption of the proliferation-dependent color product was determined with a photometer (λ = 550 nm) in the cell-culture supernatants. IL-18 stimulated cells and unstimulated cells were gently removed from the culture dishes by brief trypsin application, washed, and diluted in PBS containing 1% fetal calf serum. Cells were stained by monoclonal antibodies against ICAM-1 (CD54) and vascular cell adhesion molecule (VCAM)-1 (CD106), respectively, and analyzed by flow cytometry (FACScan, Becton Dickinson, Franklin Lane, NJ, USA). Collagenase (MMP-1) and stromelysin were measured in the cell-culture supernatants of IL-18-stimulated FLS and control cultures using commercial ELISA kits from Amersham Pharmacia Biotech (Freiburg, Germany). Granulocyte/macrophage-colony-stimulating factor (GM-CSF) – a FLS-derived growth factor that is also present and that is upregulated by IL-18 in cultured osteoblasts  – IL-6, and the chemokine IL-8 were assayed by ELISA (from, respectively, Amersham Pharmacia, Roche Diagnostics, Mannheim, Germany, and R&D Systems, Wiesbaden, Germany) after 72 hours (GM-CSF) or 24 hours (IL-6 and IL-8). Nitric oxide production was measured from its stable product, nitrite, using the Griess reaction in cell-culture supernatants after 48 and 72 hours . The release of prostaglandin E2 was determined by ELISA (Biotrend, Cologne, Germany) in 18-hour FLS cultures. IL-18 signaling with IκB-α phosphorylation and degradation, representing a key step of NF-κB activation , was assessed in IL-18Rα+β+, IL-18Rα+β-, and IL-18Rα-β- FLS from two patients with RA and one with OA and in U937 cells. For details see Supplementary material. Statistics were calculated for the entire group of RA-FLSSM and RA-FLSSF or for an indicated number of these cell cultures, by the Mann-Whitney U test for 2-tailed or untailed groups, respectively. Expression of IL-18R was detectable by semiquantitative RT-PCR in RA-FLSSM (mean ± SEM of ODQs after 35 cycles: 10.2 ± 5.2%), RA-FLSSF (ODQ 10.4 ± 2.1%), and SpA-FLSSF (ODQ 4.0 ± 1.7%), but not in OA-FLSSM (ODQ 0.7 ± 0.4%, P < 0.05). IL-18Rβ mRNA was shown by RT-PCR in RA-FLSSM (ODQ: 35 ± 12%), RA-FLSSF (ODQ: 9.8 ± 3.7%), and SpA-FLSSF (ODQ: 9.0 ± 4.4%), but, again, not in OA-FLSSM cultures (ODQ: 0.5 ± 0.5%, P < 0.05) (Fig. 1). The simultaneous presence of RT-PCR products of both IL18Rα and IL-18Rβ was clear in 5 of 20 RA-FLS cultures but in none of the cultures derived from OA or SpA. When PCR was performed under the same conditions with U937 cells, both IL-18R chains were easily detectable. Heterogeneous and noncorrelated constitutive IL-18Rα and IL-18Rβ mRNA expression in fibroblast-like synoviocytes (FLS) derived from patients with rheumatoid arthritis (RA-FLS) or spondylarthropy (SpA-FLS), but negativity for both IL-18R chains in FLS from patients with osteoarthritis (OA-FLS). Cultures 1–3 were used for IκB-α signal transduction analyses. IL-18R(α, β) = IL-18 receptor(α, β). The monocytic cell line U937 was used for comparison. Western blotting experiments in FLS reflected the results obtained on IL-18Rα, showing detectable IL-18Rα protein in three of four RA-FLS cultures but in neither of the OA-FLS cultures examined. The molecular weights found corresponded to approximately 55 and 70 kDa in all positive experiments (Fig. 2). Cross-linking experiments with a biotinylated IL-18-GST protein (44 kDa) on FLS revealed an intense 100-kDa protein complex and two additional, less intense high-molecular-weight bands corresponding to 150–200 kDa (see Fig. 2). IL-18R western blotting and cross-linking experiments. The molecular weight of IL-18Rα in fibroblast-like synoviocytes (FLS) corresponds to ~55 and ~70 kDa (lane 1: positive result in FLS from patients with rheumatoid arthritis [RA]; lane 2: negative result in FLS from patients with osteoarthritis [OA]), and is consistent with a predominant ~100-kDa complex in cross-linking experiments (bound IL-18-GST ~44 kDa) (lane 3). Two smaller bands of linked FLS membrane proteins corresponded to 150–200 kDa and suggest additional, higher-molecular-weight protein complexes containing labeled IL-18, e.g. a complex of the two IL-18R chains. Less intense staining of all cross-linked complexes by competing with unlabeled IL-18 (lane 4) demonstrates the ligand specificity of bound FLS membrane proteins. IL-18R(α) = IL-18 receptor(α). Expression of IL-18Rα in RA-FLS cultures was not detectable upon stimulation with IL-1β, IL-2, IL-12, IL-15, IL-18, IL-12 + IL-18, or TNF-α. In contrast, we found a shift to fewer PCR cycles needed to detect a specific IL-18Rα RT-PCR product, but no increase of IL-18R protein, on IFN-γ stimulation in FLS (n = 6, P < 0.05; Fig. 3). 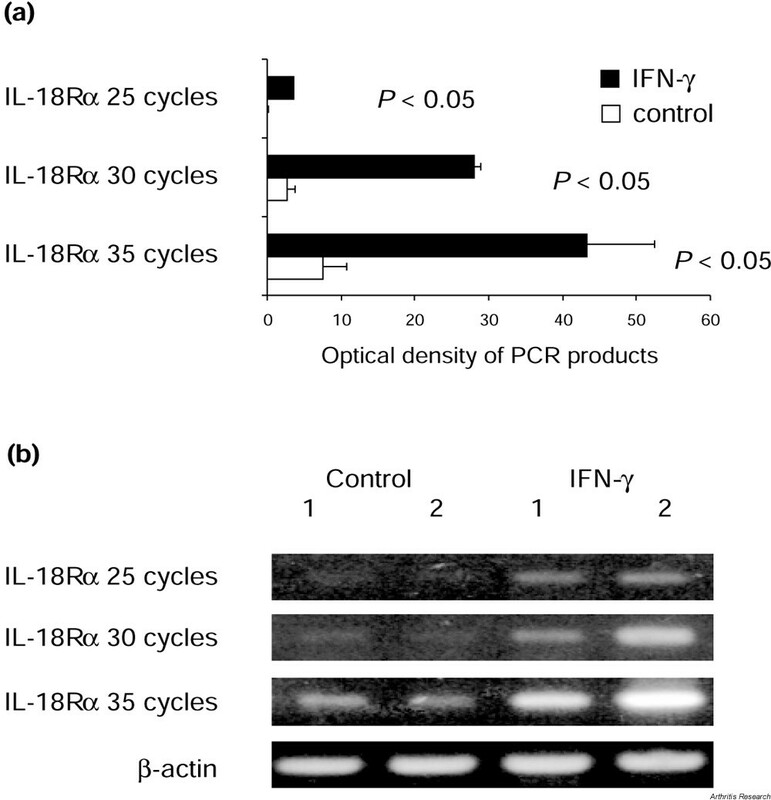 IFN-γ induces IL-18Rα mRNA expression in RA-FLS. (a) Results represent the mean ± SEM of relative IL-18Rα expression (based on the expression of β-actin housekeeping gene) in six RA-FLS cultures after 25, 30, and 35 PCR cycles. (b) IL-18Rα RT-PCR products of two representative cultures after 25, 30, and 35 cycles, and the corresponding β-actin RT-PCR products (bottom lane). FLS = fibroblast-like synoviocytes; IL-18Rα = IL-18 receptor α; RA = rheumatoid arthritis; RT-PCR= reverse transcriptase polymerase chain reaction. FLS were exposed to IL-18 in a large number of experiments. We observed some ICAM-1 induction by IL-18 (Δ mean fluorescence intensity (MFI) ≥ 20%) in 5 of 33 FLS cultures (Fig. 4a), but unresponsiveness (Δ MFI <20%) in most of the FLS cultures; in contrast, IL-18 strongly induced ICAM-1 expression in U937 cells (average Δ MFI +159%) (Fig. 4b). In addition, stimulation of FLS cultures with IL-18 neither increased cell proliferation nor upregulated any of the following in the supernatants: VCAM-1 expression, or the concentration of MMP-1, MMP-3, GM-CSF, prostaglandin E2, or NO. Nitrite levels were close to the detection limit in both groups, and even lower in IL-18-stimulated FLS than in control cultures. For details, see Table 1, and for results in U937 cells and effects in FLS caused by other stimuli, see Supplementary material. Expression of intercellular adhesion molecule (ICAM)-1 in fibroblast-like synoviocytes (FLS) (a) and U937 cells (b) upon stimulation with IL-18 (x-axis: staining intensity; y-axis: number of events). Broken and continuous lines show ICAM-1 expression in control conditions and IL-18-stimulated cells, respectively. The strongest induction of ICAM-1 by IL-18 (a) was 95.1, versus 73.9 in controls (ΔMFI = +28.6%), and (b) 82.1, versus 31.7 in U937 cells (ΔMFI = +159%). The result of each one of three similar independent experiments is represented. CD54PE = fluorescence intensity of cells, stained with phycoerythrin-labeled CD54 monoclonal antibodies; MFI = mean fluorescence intensity. Values are means ± SD (range in parentheses). Significance was calculated using the Mann-Whitney test for two-tailed groups. Differences were statistically insignificant except as indicated. **P < 0.01. GM-CSF = granulocyte/macrophage-colony-stimulating factor; ICAM = intercellular adhesion molecule; MMP = matrix metalloproteinase; SD = standard deviation; VCAM = vascular cell adhesion molecule. IκB-α was assayed in an IL-18Rα+β+, an IL-18Rα+β-, and an IL-18Rα-β- FLS culture, on the basis of the RT-PCR results. Rapid Ser32 IκB-α phosphorylation and degradation was observed in the cell-protein preparations from IL-18Rα+β+ FLS (Fig. 5) and U937 cells, but not in FLS cultures, in which the mRNA level of one or both IL-18R chains was below the RT-PCR detection limit. Immunoblotting of Ser32-phosphorylated IκB-α (top, after immunoprecipitation), and total IκB-α (bottom) shows rapid IL-18-induced IκB-α phosphorylation and degradation in IL-18Rα+β+ fibroblast-like synoviocytes (culture 3 in Fig. 1). One of two similar independent experiments is presented. IκB-α = inhibitor of kappaB α; IL-18R(α, β) = IL-18 receptor (α, β). As is known from lymphocytes and various transformed human cell lines, including fibroblasts, the presence of both IL-18R chains is an important factor in their cellular response limiting the action of IL-18 . In our experiments, many of the RA-FLS cultures studied expressed at least one IL-18R chain, but the PCR analyses considered with the results of the IκB-α assays showed that only 5 of 20 RA-FLS long-term cultures, and none of the OA or SpA FLS cultures, expressed both receptor chains in amounts sufficient for functionality of the receptor complex. For suggested ligand binding of IL-18Rα/β chains, see Supplementary material. FLS are a heterogeneous cell population [8,21], whose characteristics may even depend on the preparation technique used , and we found remarkable differences of IL-18R expression among the FLS cultures as one correlate of their diversity. IκB-α activation was demonstrable only in IL-18Rα+β+ RA-FLS and in the U937 monocyte cell line. For induced expression of IL-18Rα in FLS, see Supplementary material. Preliminary experiments had shown the expression of an IL-18-binding protein in FLS cultures. Presence of this IL-18 decoy receptor had to be considered as possibly accounting for the missing IL-18 bioactivity in our experiments, but the mRNA levels found for this decoy protein in the FLS cultures elicited no demonstrable IL-18-binding protein immunoreactivity in other FLS culture supernatants (data not shown). Considered in combination with the cross-linking data, this finding shows that IL-18-binding protein is therefore not likely to account for IL-18 resistance of FLS in long-term culture. The lack of IL-18 response in most FLS cultures appears to be based on a rather low or missing constitutive expression of IL-18Rα or IL-18Rβ. Despite relevant IL-18R expression and IL-18 signaling in some FLS cultures, all the cultures we studied were, in contrast to U937 cells, more or less refractory to IL-18 in respect of a postulated upregulation of any disease relevant molecule investigated here. Methodological influences have to be considered in analyzing the results of fluorescence-activated cell sorting (FACS) in FLS , but the uniformity of results showing IL-18 resistance for many target molecules in almost all long-term FLS cultures suggests additional, as-yet-unknown IL-18-inhibiting post receptor events in these cells similar to the situation in transformed human fibroblasts . U937 cells, with a constitutive IL-18R expression similar to that found in IL-18α+β+ FLS, effectively responded to IL-18 with high levels of ICAM-1 expression. Primary SF macrophages are, furthermore, known to be responsive to IL-18 as shown by enhanced TNF-α production , and these cells with a capacity for immediate IL-18 response, together with IL-18R+ T cells, thus seem responsible for the proinflammatory IL-18 effects in arthritis. Constitutive expression of IL-18R is present in a minor but quantitatively relevant group of RA-FLS in long-term culture, and expression of both known IL-18R chains seems to be a prerequisite for IL-18 signaling in these cells. However, cultured FLS were refractory to IL-18 stimulation. This observation is in sharp contrast to the results in monocytes and macrophages and strengthens the argument that these cells, acting in synergy with T cells, account for the proinflammatory effect of IL-18 in rheumatoid arthritis. IL-18 was first described as a T-cell activating, interferon-gamma- (IFN-γ)-inducing factor [S1], but it also exhibits a broader spectrum of proinflammatory effects. For example, IL-18 shows IFN-independent effects in the murine model of arthritis induced by streptococcal cell walls [S2] and directly induces TNF-α production in macrophages derived from synovial fluid . In contrast, stimulation of IL-1β and IL-8 by IL-18 in peripheral blood mononuclear cells is T-cell-dependent [S3]. IL-18 promotes collagen-induced arthritis in mice through mechanisms that may be distinct from those that operate with IL-12, another important IFN-γ-inducing molecule [S4]. IL-18R expression is known to occur in several lymphatic and myeloid cell lines [S5], primary T and B lymphocytes, and natural killer cells [S6,S7]. IL-18 activity in unstimulated T cells is limited by low basal IL-18R expression levels; one explanation for their synergism with IL-18 is upregulated expression of IL-18R by co-stimulatory molecules IL-12 or IL-15 [1,2,3,4]. IL-18R regulation plays a pivotal role in T-cell function and decides whether T lymphocytes become polarized to either Th1 or Th2 cells [S8,S9]. RNAzol™ B was purchased from CINNA, Cincinnati, OH, USA. SuperScript™ RT-II, Taq polymerase, PBS, penicillin, streptomycin, glutamine, and RPMI 1640 medium were supplied from GIBCO BRL, Eggenstein, Germany. Ham's F10 medium was purchased from Bio Whittaker, Verviers, Belgium; collagenase, protease inhibitors benzamidin, aprotinin, and phenylmethylsulfonyl fluoride (PMSF) were from Sigma, Deisenhofen, Germany. Trypsin–EDTA was from PAN Biotech, Aidenbach, Germany, FCS from Boehringer-Ingelheim, Ingelheim, Germany, and the cross-linker bis(sulfosuccimidyl) suberate was purchased from Pierce, Rockford, IL, USA. A human IL-18 GST fusion protein (molecular weight [MW] ~44 kDa) was cloned after full-length RT-PCR, inserted in a pGEX4T2 vector (Pharmacia, Freiburg, Germany) and expressed in Escherichia coli. IL-18-GST was purified in glutathione–agarose (Sigma) columns and biotinylated in accordance with standard protocols [S10]. Previous experiments have shown that this fusion protein is bioactive [S11]. Recombinant human IL-1β (1 ng/ml), IL-2 (100 ng/ml), IL-12 (1 ng/ml), IL-15 (100 ng/ml), IL-18 (10 nM), IFN-γ (5 ng/ml), and TNF-α (10 ng/ml) were purchased from Pepro Tech EC Ltd, London, UK (concentrations used are given in parentheses). IL-18 receptor antibodies and IL-18 ELISA kits were provided from R&D systems. FITC-conjugated rabbit antigoat secondary antibodies were purchased from Jackson ImmunoResearch, West Grove, PA, USA. FITC-conjugated CD90/Thy-1 and CD106/VCAM-1 antibodies were purchased from Dianova, Hamburg, Germany. FITC-conjugated CD14, phycoerythrin-conjugated CD54 (ICAM-1), phycoerythrin-conjugated CD86 antibodies, and culture flasks were from Becton Dickinson, Franklin Lane, NJ, USA. Cells were lysed with RNAzol™ followed by RNA extraction and reverse transcription into cDNA with SuperScript™ RT-II, in accordance with the manufacturers' instructions. RT-PCR was performed for IL-18Rα using endpoint or multistep PCR kinetics (25–35 cycles), and IL-18Rβ by anchored RT-PCR under the following conditions: IL-18Rα sense GTC AAC AGC ACA TCA TTG TAT, antisense TAG AAT TCT TAT GTT TTT CCA TCT, annealing temperature 60°C, length of the RT-PCR product 670 bp. IL-18Rβ sense TAC CAG AGC AAG GAT CAG ACG C, antisense CAA TCC CAT TCC ATT GTC CAT C, optimal annealing temperature 56°C, 30 cycles, length of the PCR product 772 bp. IL-18Rβ anchored RT-PCR antisense primer: CCA GGG CTC ATT TCA CCA TTC, 20 additional cycles, length of this RT-PCR product 630 bp. Expression of the β-actin housekeeping gene was determined to ensure equivalent amounts of the extracted RNA: β-actin sense primer TCG AGC ACG GCA TCG TCA CCA ACT, antisense primer ACC GCT CAT TGC CAA TGG TGA TGA, annealing temperature 60°C, 30 cycles, length of the PCR product 552 bases. Ethidium bromide-stained DNA was visualized in ultraviolet light and quantified with Molecular Analyst software (BIORAD, Munich, Germany). For IL-18R western blotting, 5 × 106 FLS was lysed on ice in buffer solution containing 20 mM TRIS (pH8.0), 137 mM NaCl, glycerol 10%, Nonidet P-40, 10 mM EDTA, 100 mM NaF, 1 mM PMSF, aprotinin, 20 μM sodium orthovanadate, and 4 μM leupeptin. Proteins were separated by electrophoresis in 15% SDS–PAGE and blotted onto a nitrocellulose membrane. Membranes were stained with an IL-18R-specific antibody and a secondary anti-goat IgG antibody (R&D Systems, Wiesbaden, Germany). Bound antibodies were visualized by chemiluminescence. RA-FLS with presence of both IL-18R chains in RT-PCR analyses were removed from the flasks using ice-cold PBS and a cell scraper. Cells were thoroughly washed in PBS containing benzamidine (10 mM), aprotinin (100 U/ml), and PMSF (1 mM). Each sample of 1 × 106 cells was either incubated with biotinylated IL-18 GST-fusion protein (final concentration 25 μg/ml) or a mixture (1:100) of biotinylated and unlabeled IL-18 GST-fusion protein for 1 hour on ice. Cross-linker BS3 (0.5 mM) was added to the cells for 10 min. Free cross-linker molecules were eliminated with 25 mM glycine and the cells were washed with PBS. Cell pellets were solubilized with Triton (1%) and protease inhibitors in PBS on ice for 20 min. Solubilisates were vortexed every 5 min before centrifugation of the cellular debris. 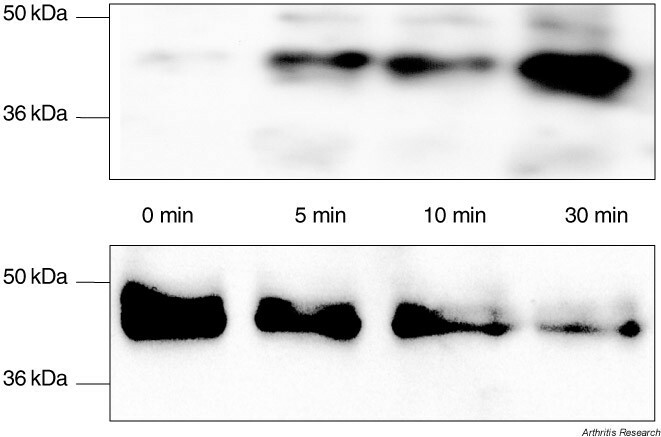 Dissolved proteins were separated on a 15% SDS–polyacrylamide gel and visualized as biotin–conjugated protein complexes by streptavidin-peroxidase reaction. We used the Phospho Plus IκB-α (Ser32) Antibody Kit from New England Biolabs (Beverly, MA, USA), in accordance with the manufacturer's instructions. Total IκB-α was determined by direct western blotting, and phospho-rylated IκB-α was estimated by immunoprecipitation. Each sample of 5 × 106 cells was stimulated with IL-18 for 5, 10, or 30 min. Stimulation was stopped on ice, cells were thoroughly washed, and lysates were prepared in Tris–HCl buffer (pH6.8) containing 2% SDS, 10% glycerol, 50 mM dithiothreitol, and 0.1% bromphenol blue. Each sample of 20 μg protein lysate was separated by 12.5% SDS–PAGE and blotted onto a nitrocellulose membrane. Immunoprecipitation for phospho-IκB-α was performed overnight using anti-IκB-α rabbit polyclonal IgG antiserum (New England Biolabs). Antibody-IκB-α complexes were bound to protein A sepharose CL-4B (Sigma), centrifuged, and washed in TRIS–HCl buffer containing 0.2% NP-40 and 0.25 mM protease inhibitor PMSF. Sepharose beads were separated by boiling for 5 min in 10 μl SDS buffer and centrifuged. Supernatants were separated by SDS–PAGE. Membranes were blocked in triethanolamine-buffered saline solution overnight and stained with IκB-α or phospho-IκB-α (Ser32) rabbit polyclonal antiserum. 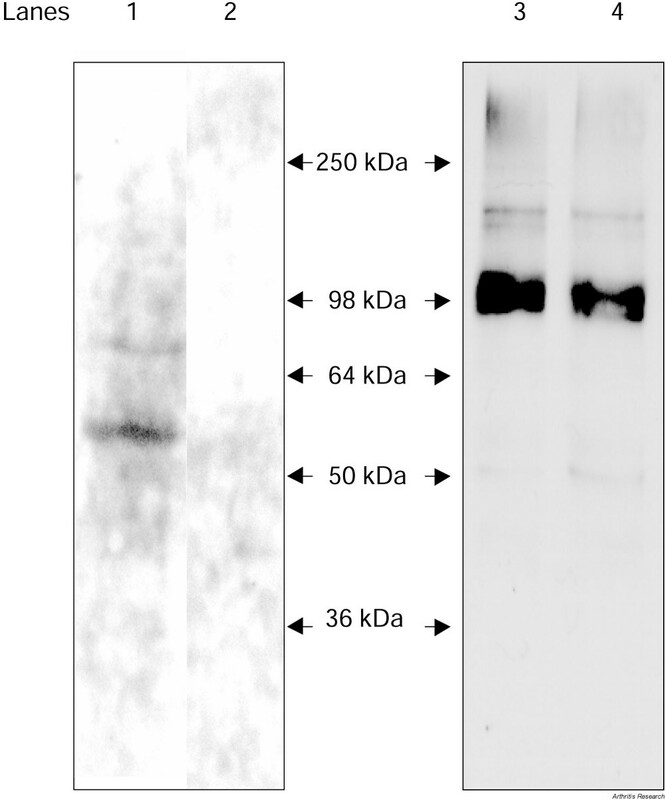 Bound antibodies were detected with a secondary antirabbit antibody conjugated to horseradish peroxidase, and LumiGLO chemilu-miniscent reagent (New England Biolabs). IL-18Rα protein levels in RA-FLS remained unaffected by IFN-γ stimulation in western blotting experiments (n = 3, data not shown), and IL-18Rα mRNA levels in U937 cells were not inducible (differences of ODQ of IL-18Rα/β-actin PCR products upon stimulation <50%) by any of the indicated stimuli. Induction of ICAM-1 by IL-18 in U937 cells was identical to that observed by TNF-α stimulation, and induction by IL-18 was not further enhanced by simultaneous IL-12 challenge. In agreement with this observation, we found no upregulation of IL-18R transcripts by any of the cytokines studied (increase of ODQ <50% in all experiments). In contrast to the lack of a proinflammatory effect by IL-18 stimulation in FLS, strong prostaglandin E2 induction (>2000 pg/ml, n = 12) was observed within 18 hours in those FLS cultures exposed to IL-1β, thus excluding anergy of the studied long-term-cultured FLS to other cytokine stimuli. IL-18R expression in FLS and IL-18 ligand binding on FLS surfaces were confirmed by western blotting and cross-linking experiments, respectively. The finding of IL-18R bands at ~55 and ~70 kDa in western blotting experiments is essentially in agreement with the wide band of published IL-18Rα molecular weights [10,S5], and IL-18 cross-linking on FLS membranes exhibited a predominant 100-kDa complex, suggesting a complex of biotinylated IL-18-GST with IL-18Rα. In contrast to the rather low binding affinity of the IL-18Rα-chain , the isolated receptor β-chain was initially reported to be ineffective for IL-18 ligand binding  but was recently shown to enhance IL-18 ligand-binding affinity together with the IL-18Rα-chain . We found two high-molecular-weight complexes, of about 150–200 kDa. In agreement with previous observations [10,11,13], quantitatively predominant ligand binding to IL-18Rα alone and, to a minor extent, binding to both IL-18R chains may be also supposed from the cross-linking experiment in FLS, assuming that the ~87-kDa MW of IL-18Rβ protein estimated by the amino acetic acid sequence is correct [S12]. IL-18Rα mRNA expression in FLS was inducible by IFN-γ, whereas amounts of IL-18R protein remained unaffected by this stimulus within the first 72 hours. This discrepancy may be attributable to a missing or very slow translation of IL-18Rα transcripts. However, some enhanced FLS sensitivity to IL-18 due to longstanding influences of an inflammatory environment should be considered. This project was supported by grants from Aventis Pharma, Frankfurt, Germany; the Heinrich and Fritz Riese-Foundation; and the Paul and Ursula Klein Foundation, Frankfurt, Germany. We are grateful to Dr Roland Kurrle (Aventis Pharma, Bridgewater, NJ, USA) for the stimulating discussion, and we gratefully thank Julia Bauer for her excellent technical support.